Three-year-old Nia Glassie has become the poster-child for child abuse in New Zealand. Nia suffered severe head and abdominal injuries, allegedly inflicted by her step-grandfather and other members of her extended family, after reportedly being hung from a clothesline and spun in a clothes dryer. The toddler died in hospital after being taken off life support. Five people have been charged with assaulting the little girl. Additional charges may stem from her death. It is believed that Nia had been subjected to months of torture-like abuse. Recently, three minutes of silence was observed in New Zealand, representing Nia's three years of life. It was also intended to symbolize the 12 children who die from child abuse in the country each year. According to Christine Rankin, CEO of For the Sake of Our Children Trust, 60% of child abuse cases involve Maori, but the Maori people represent only 15% of the population of New Zealand. My Comments: Blaming the problem on the Maori people is simplistic, amounts to little more than finger-pointing, and does nothing to address what many are calling an epidemic. The fact is, the Maori people of New Zealand are over-represented in a number of social statistics, including prison populations, poor health and mortality rates, educational under-achievement, and low income. Socio-economic problems are a huge factor in child abuse statistics. But it's a lack of funding for support and educational services that are at the core of ongoing unchecked child abuse. A year ago, 3-month-old twins in New Zealand died at the hands of the adults who should have been protecting them. People were outraged. 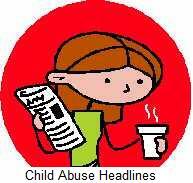 The government representatives said "child abuse is inexcusable". A year later, nothing has changed. The New Zealand government must incorporate intervention and prevention strategies that encompass all aspects of society. Support services must be available to victims of child abuse so that the cycle of abuse is broken. There must be programs that teach appropriate parenting skills. Schools must provide a life-skills curriculum for students that include classes on effective parenting and healthy relationships, not just career planning and the 3 R's. Students need to grow up to be productive members of society in all aspects of life. New Zealand has programs in effect, but too little is being done to ensure that they are brought to the people who so desperately need them. Until support and educational programs are made available and not just given lip service, abuse rates will continue to rise. Communities will be left in ruin with staggering crime rates, increased drug and alcohol abuse, truancy, and a gravely diminished workforce for the future. The negative impact on communities will not be limited to Maori or any other people of New Zealand; the destructive effects will be catastrophic for the entire country.